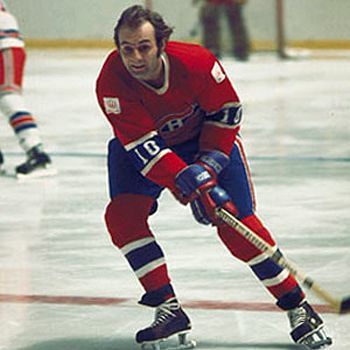 After beginning he career with the Quebec Aces of the Quebec Junior Hockey League in the 1966-67 season with eight games, Guy Lafleur, born on this date in 1951, played two more seasons for the Aces, scoring 30 goals and 49 points in 43 games in 1967-68, but really turned heads in 1968-69 with 50 goals and 110 points in 49 games of the 1968-69 season, averaging more than a goal and more than an assist per game. 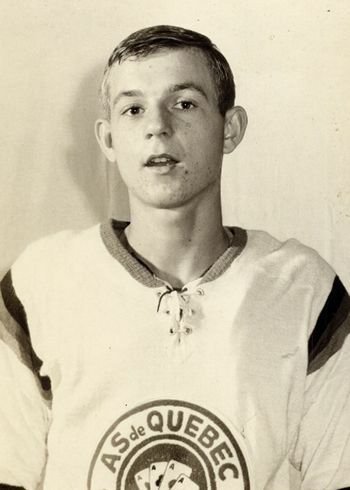 He then progressed up the ladder to the Quebec Remparts of the Quebec Major Junior Hockey League, where he blossomed with a league leading 103 goals and 170 points in 56 games in 1969-70. Then, in just 15 playoff games, Lafleur scored 43 points from 25 goals and 18 assists. With Lafleur looking to be a can't miss NHL prospect available in the 1971 NHL Draft, the Montreal Canadiens General Manager Sam Pollock, looking to replace the aging Jean Beliveau, who would play just one more NHL season, fleeced the California Golden Seals by sending them Montreal's first choice in the 1970 draft and Ernie Hicke for not only the Golden Seals first pick in the 1971 draft, but a player, Francois Lacombe, as well. 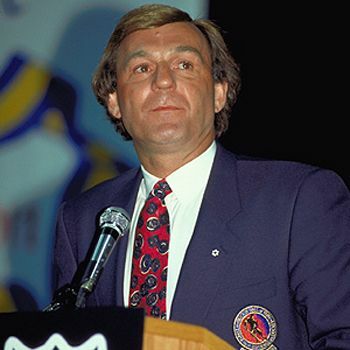 Lafleur announced his readiness for the NHL with a stellar second season with the Remparts, when he again led the league with an astonishing 130 goals on his way to a 209 points to earn the Jean Beliveau Trophy as the QMJHL scoring champion. Lefleur then duplicated his playoff performance from 1970 when he scored an identical 43 points, only now in one game less than the previous year, 14. 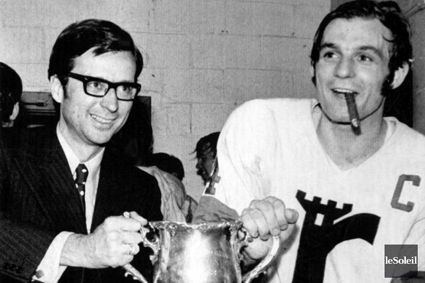 The Remparts then advance to the Memorial Cup playoffs, where the prolific Lafleur averaged 2 points per game with 9 goals and 5 assists in 7 games as Quebec won the Memorial Cup. Hoping the Golden Seals would come through by finishing last, Pollock was alarmed when the Los Angeles Kings began playing quite poorly in 1970-71. In an effort to shore up the Kings, Pollock sent veteran Ralph Backstrom to Los Angeles. The addition of Backstrom ensured that the Kings would avoid the cellar and secured the first pick of Lafleur for Montreal. With Lafleur safely now a part of the bleu, blanc et rouge, he produced 29 goals and 64 points as an NHL rookie in 73 games in 1971-72. His next two seasons were similar, with 28 goals and 55 points in 1972-73 and a drop in goals to 21 in 1973-74, but an increase in assists saw his point total increase to 56. 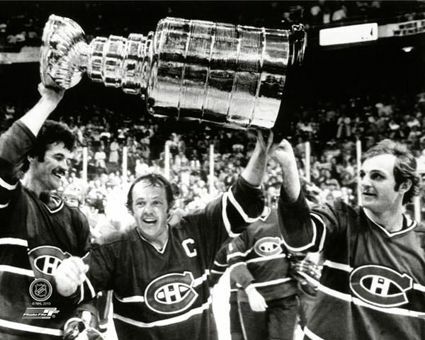 During the 1973 playoffs, Lafleur contributed 3 goals and 8 points in 17 games as the Canadiens won the first Stanley Cup of his career. As if someone flipped a switch, Lafleur took his game to another level for the 1974-75 season when he scored the first of his six consecutive 50 or more goal seasons when he scored 53 goals and 66 assists for 119 points to lead the Canadiens in scoring for the first time. 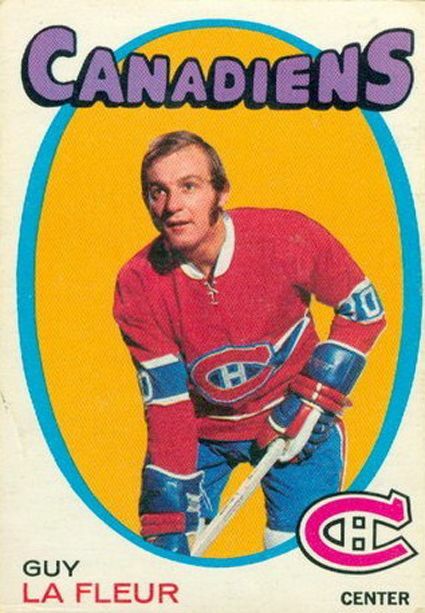 The 1975-76 season saw Lafleur lead not only the Canadiens, but all of the NHL with 56 goals and 69 assists for 125 points for his first Art Ross Trophy. During the Stanley Cup playoffs, Lafleur would score the cup winning goal for Montreal as they defeated the two-time champion Philadelphia Flyers, whose slug it until you win it style could not overcome the speed and skill of the Canadiens. Following the season, Lafleur was voted as the winner of the Pearson Award as the Most Valuable Player by his fellow players. 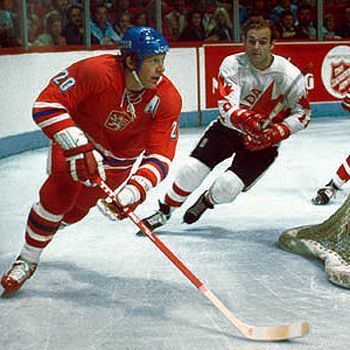 Before the 1976-77 season began, Lafleur made his international hockey debut as a part of Team Canada that would win the inaugural Canada Cup tournament over Czechoslovakia. 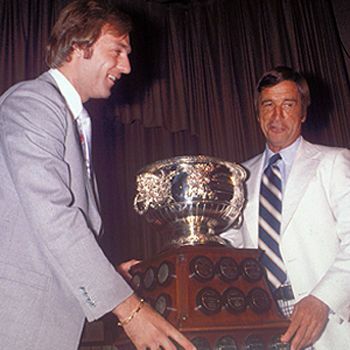 Lafleur would dominate the 1976-77 NHL season when he won his second consecutive Art Ross Trophy with a career high 136 points from 56 goals and 80 assists. He would finish the season a +89 and win not only the Pearson Award, but also his first Hart Trophy as NHL MVP as voted on my the NHL Hockey Writers Association. His 9 goals and 17 assists would lead all players in playoff scoring as the Canadiens would win the 1977 Stanley Cup over the rival Boston Bruins. His efforts would earn Lafleur the Conn Smythe Trophy as playoff MVP. 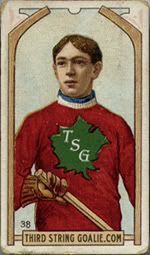 In recognition of his outstanding NHL season, he was the recipient of both the Lionel Conacher Award as Canada's Top Male Athlete and the Lou Marsh Trophy as Canada's Top Athlete. Still fully on top of his game, the fluid skating right winger continued to dominate the NHL in 1977-78. He set a career high by hitting the 60 goal plateau and added 72 assists for 132 points to claim his third consecutive Art Ross Trophy as the NHL's leading scorer. He would also win his second consecutive Hart Trophy and third straight Pearson Award as league MVP. The Canadiens, led by Lafleur's 21 points in 15 games, would defeat the Bruins again for their third straight Stanley Cup, the fourth of Lafleur's career. Despite a 52 goal, 129 point season, Lafleur would finally have to relinquish his standing at the NHL's top scorer, finishing third behind Bryan Trottier (134) and Marcel Dionne (130). 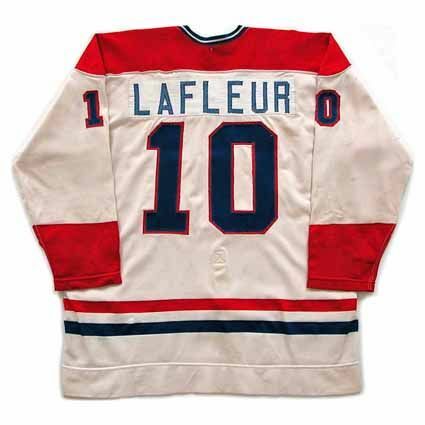 Al l was not lost, however, as the Canadiens would capture their fourth consecutive Stanley Cup and 5th for Lafleur, when they defeated the New York Rangers as Lafleur led the team in scoring with 23 playoff points. 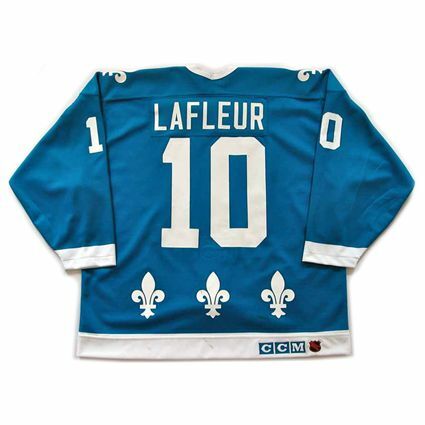 During the 1978-79 season, Lafleur was also named as a member of the NHL All-Star team that took part in the 1979 Challenge Cup, a three game series against the Soviet Union that took the place of the traditional NHL All-Star Game that season. 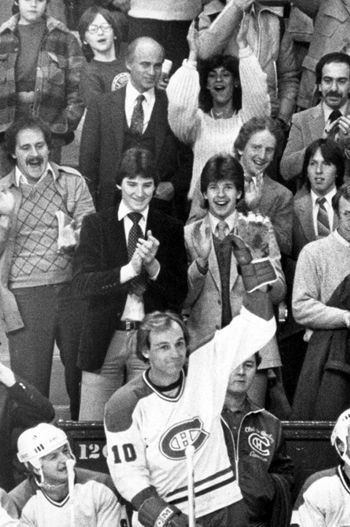 Lafleur's sixth and final 50 goal season came in 1979-80 when he led the Canadiens for the sixth consecutive season with 125 points, which was again good for third in the league behind NHL newcomer Wayne Gretzky and Marcel Dionne, who tied with 137 points. His feat made him the first player to ever have six consecutive 50 goal, 100 point seasons in league history. Age and injuries would begin to take their toll on Lafleur beginning with the 1980-81 season, as he was limited to 51 games, never having played less than 70 during his previous nine NHL seasons. He did score his 1,000th point on March 4, 1981, setting a then NHL record for the fastest player to 1,000 points, having done so in just 720 games. In 1981-82 he saw action in 66 games followed by 68 in 1982-83. During each of those shortened campaigns, Lafleur scored an identical 27 goals, with 84 points in 1981-82 being his best. In 1982-83, Montreal was a shadow of it's former self, and Lafleur's 76 points were enough to lead the team in scoring for the seventh time. 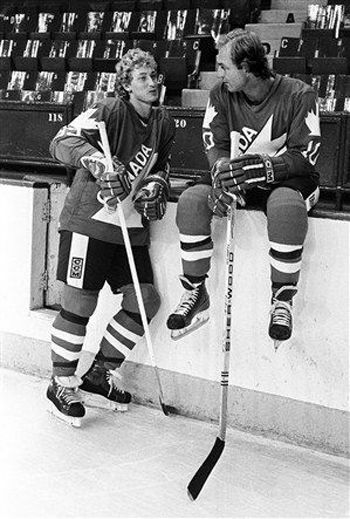 During that time period, Lafleur competed in his only World Championships for Canada in 1981, scoring a goal in 7 games as well as taking part in his second Canada Cup later that fall as the Canadians finished as runner up to the Soviets despite Lafleur scoring 11 points in 7 games. He played in all 80 of Montreal's games in 1983-84, scoring 30 goals and 70 points as the Canadiens team leader once more. Mind you, Gretzky led the league with 205 that season... After three consecutive first round postseason exits, the Canadiens did go on a nice run, making it to the third round of the playoffs, but Lafleur only contributed 3 assists in 12 of Montreal's 15 games. His final season with Montreal saw him play just 19 games, scoring just 2 goals and 5 points, before he decided to retire. In front of 18,000 fans, he took one last skate around the ice and received a five minute standing ovation. "After 13 years, I couldn't accept to be number two. I'm proud of what I did in the past and I'm proud I played for the Canadiens, especially on five Stanley Cup winners. I was in a slump and I wasn't scoring much a the time. I was frustrated," Lafleur recalled about his decision to retire. 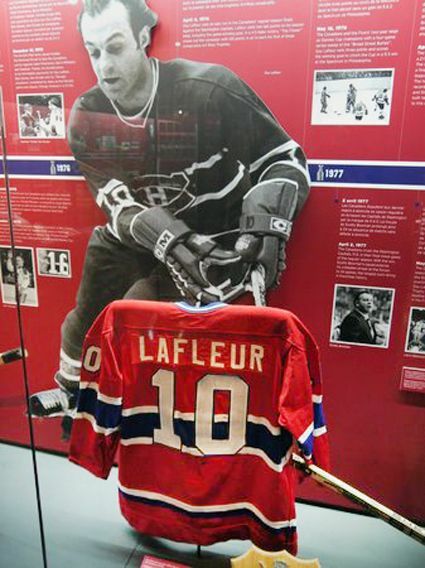 Lafleur became the sixth Canadien to have his number retired and was inducted into the Hockey Hall of Fame on 1988. However... he still believed he could play after three seasons away from the game and signed to play with the New York Rangers for the 1988-89 season. He played in 67 games for New York before being sidelined by a knee injury, becoming only the second player after Gordie Howe to play after being inducted into the Hockey Hall of Fame. He totaled 18 goals and 45 points, including scoring twice during his first game back in the Montreal Forum against Patrick Roy as the fans chanted his name every time he touched the puck just as they had during the peak of his career as a Canadien. 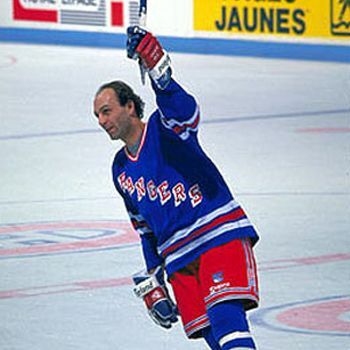 Rangers head coach, and Lafleur's close friend Michel Bergeron was dismissed and joined the Quebec Nordiques, who also signed Lafleur for the 1989-90 season, who stood out on the ice, as he was allowed to play without a helmet, while all new players into the league were now required to wear one since the 1979-80 season. Lafleur reportedly turned down a more lucrative offer from the Los Angeles Kings, preferring to play in his native Quebec. 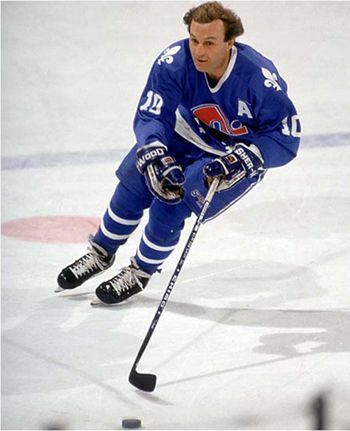 During his two seasons with the Nordiques, Lafleur played in 39 games his first season, scoring 12 goals and 34 points, followed by 59 games in 1990-91, again scoring 12 goals on his way to 28 points before he retired again, this time for good. 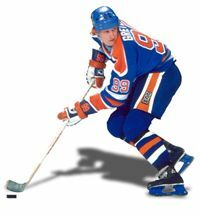 His final NHL totals were 560 goals and 793 assists for 1,353 points in 1,126 games with an additional 58 goals and 134 points in 128 playoff games. He won five Stanley Cups, 3 scoring titles, 2 Hart Trophies and 3 Pearson Awards as MVP, a Conn Smythe Trophy and a Canada Cup. 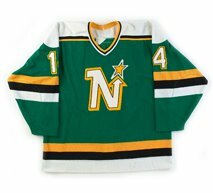 Lafleur also played in the NHL All-Star Game in 1975, 1976, 1977, 1978, 1980 and 1991 as well as being on the Challenge Cup team in 1979. He is the Canadiens all-time scoring leader and holds the club single season scoring record with 136. 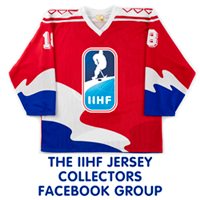 Today's featured jersey is a 1977-78 Montreal Canadiens Guy Lafleur jersey as worn during his career year when he set a personal best and Canadiens team record of 136 points on his way to winning the Art Ross Trophy, the Hart Trophy and the Pearson Award as well as the Stanley Cup. 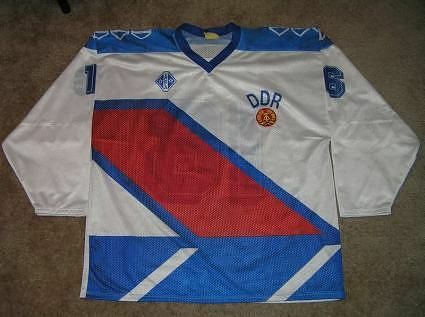 This style jersey dates back to 1941 and, aside from a version with a blue stripe around the chest for three years in the late 40's, has remained essentially unchanged ever since. 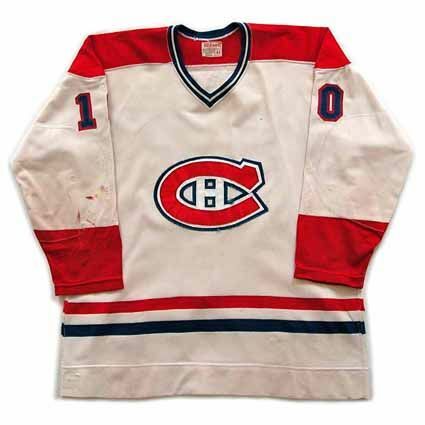 Bonus jersey: Today's bonus jersey is a 1971-72 Montreal Canadiens Guy Lafleur jersey as worn during Lafleur's rookie season in the NHL. 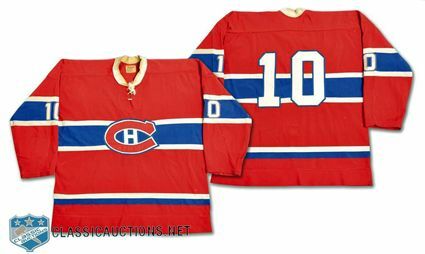 The Canadiens red sweaters with the blue band around the chest date back to before the formation of the NHL in 1917 and this exact variation with the lace up collar and numbers inside the arms stripes dates back to 1966-67 and remained in use through 1974-75 when it was replaced by a new v-neck collar. 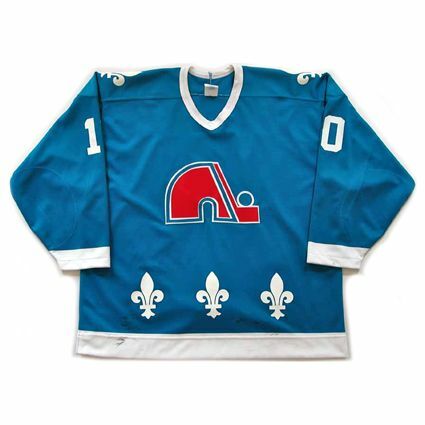 Extra bonus jersey: Today's extra bonus jersey is a 1990-91 Quebec Nordiques Guy Lafleur jersey as worn during his final season in the NHL, his second in Quebec. Today's video section is the always excellent Legends of Hockey series profile of Lafleur.